Photos of my family over the years... not very many photos, but some interesting ones with our family. 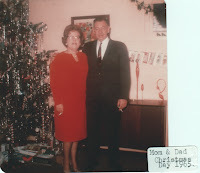 No one in our family was a great photographer, so there are lighting problems, slightly fuzzy outlines, etc. But here we go. First with our Christmas tree, "any year" - we loved to drench it with silver [aluminum] tinsel! The little notes on the photos are from my Mom's work, when she made individual photo albums for all 3 of us kids, one Christmas. Every photo was labelled. 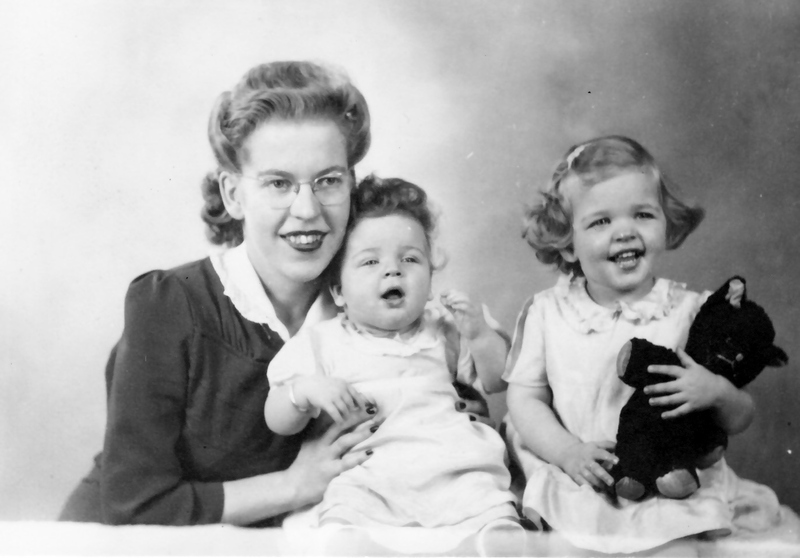 Here I am, less than a year old, sitting in Mom's lap, big sister beside me. 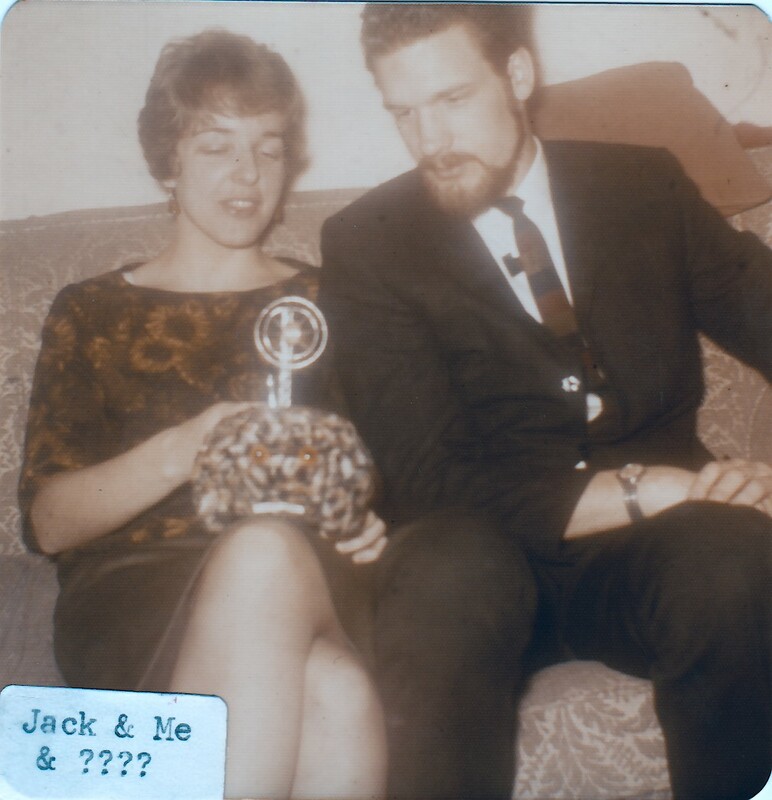 Dad is in the Army, back east in Ontario. 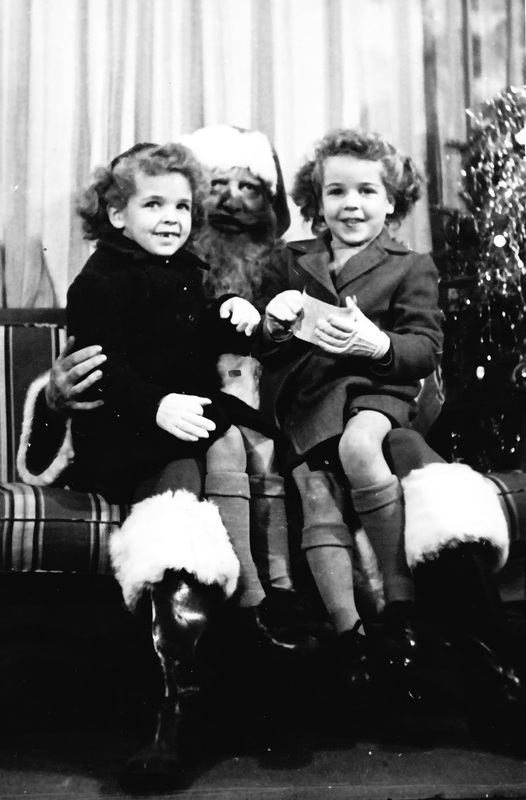 Right: 1947: my sister and I are sitting on Santa's lap. I'm on the right here. 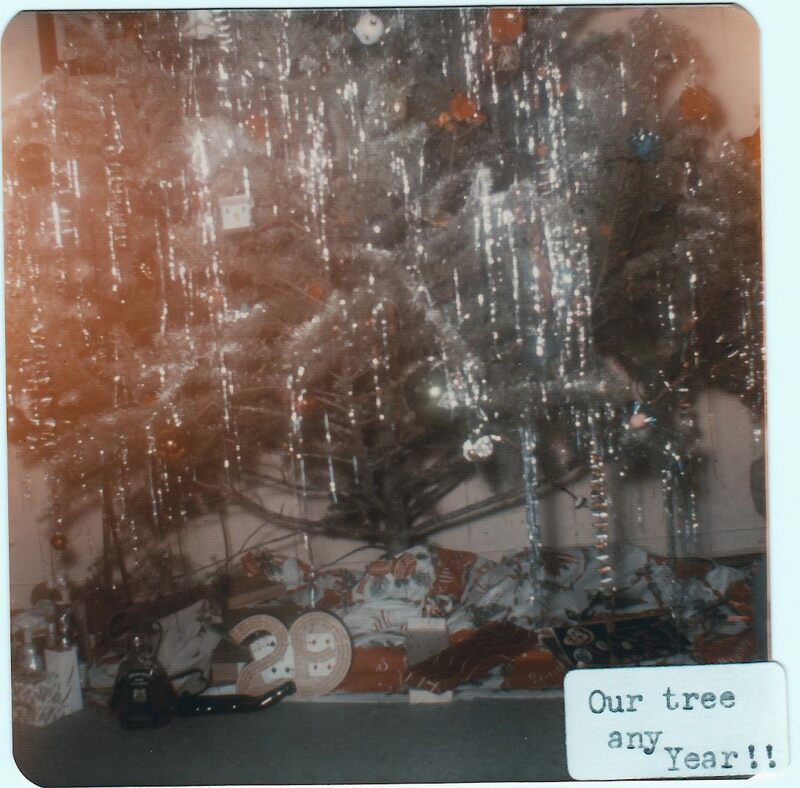 Here are Gillespie's, Bunn's, Engelland's, and Bell's, I actually have no memory of this Christmas get together at my parent's home - I recognize the sofa and the piano window behind the tree so I know it's at our home. Grandpa & Grandma Gillespie are the older couple sitting down, with Mom standing with her hands on Grandpa's shoulders. I'm standing behind Grandma, big sister is in front of Grandma. Cousins and aunts and uncles abound. Clearly there are others on the left hand side - like my brother? 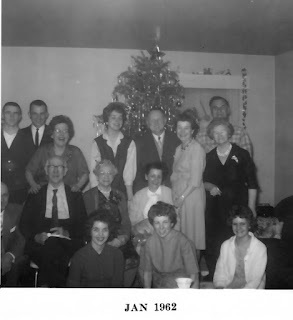 And you can see a smidge of Uncle John Engelland on the extreme left; his wife, Aunt Elsie, is standing on the right in the dark dress, next to Stan & Agnes [Bunn] Bell. I'm in a photo all by myself! This year I'm in University, travelling completely across the city twice a day. Feeling so grownup! I've started my first year, taking Chemistry, Zoology, Mathematics, English, Psychology. A wonderful start. Meeting new people, enjoying the wonderful world of science! Right: abt 1964: This is my (now-ex-husband) boyfriend, who had given me a cute gift, a "Space-Warp" toy. Space was becoming a big thing back then. Sputnik 1 successfully orbited October 4 1957! I remember looking up on clear nights and watching it go over. 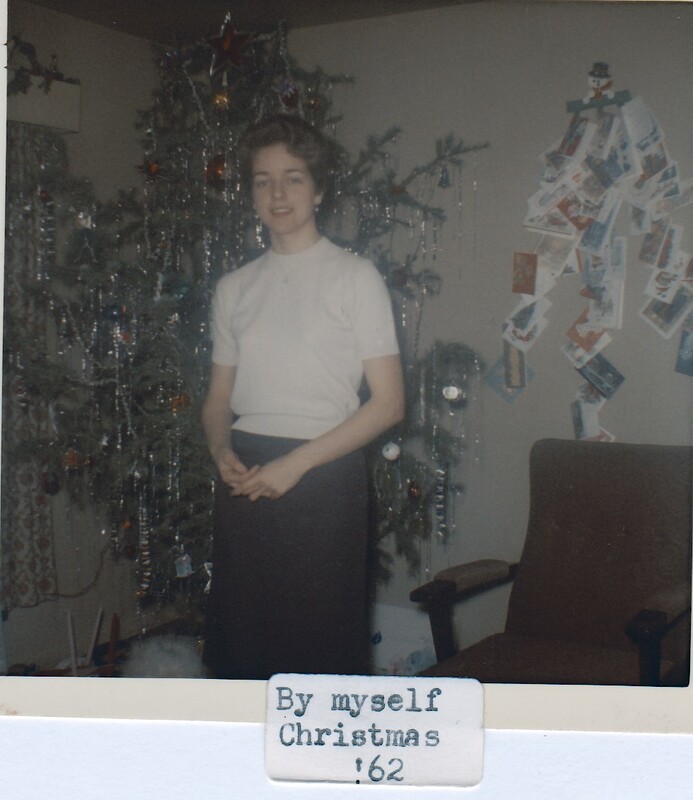 I sewed my top and skirt I'm wearing, I remember. Both of them are smoking. Mom has just turned 42, Dad is 57. Both smoked a carton and a half of cigarettes each week. That's 15 packages, each, each week. Amazing. Both died of smoking-related disease. It was completely normal to see them with a lit cigarette in their hands. I'm the only one who never smoked ciggies in our family. Here I am in 2007, the Christmas before I retired, my cane hidden beside the chair. 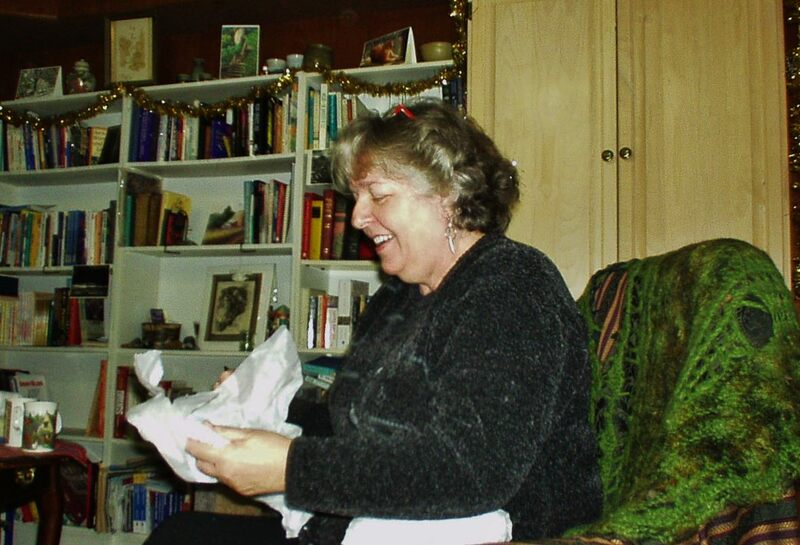 At my heaviest (I've lost over 60# since then), this is about 5 months before my knee replacement surgery. 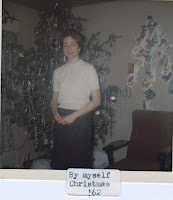 I seem to have lost a few of my Christmas photos-? I can 'see' them in my mind, but not on my computer. Hmmm. Time for more searching and possibly more scanning of photos! Do contact me if you have questions or information - or photos!! I would love to hear from you via calewis at telus dot net, as my Blogger account updated and stopped me from being able to actually 'reply' to your comments. Thank you so much for stopping by and reading this post. Happy Holidays!